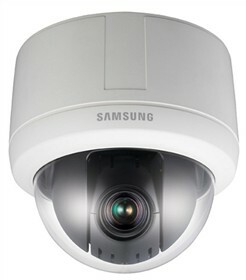 The Samsung SCP-3120 High Resolution WDR PTZ Dome Camera (12x) with a 1/4” EX-view HAD PS color CCD image sensor delivers clear images at a resolution up to 600TVL (color) and 700TVL (b&w). With built-in 12x optical zoom and 16x digital zoom, the camera can capture clear remote images without compromising the image quality. Featuring Motion Adaptive Digital Noise Reduction, it delivers clear images by removing signals that could result in video noise. With the Wide Dynamic Range technology and a minimum illumination of 0.7 lux, the camera delivers clear images even in low light conditions. The camera also uses a removable IR cut filter to switch between color and b&w as per the changes in ambient lighting. Backlight compensation adjusts video gain to correct the exposure when the object being captured is in front of a bright light. The Samsung SCP-3120 has many exciting features for users of all types. See the Samsung SCP-3120 gallery images above for more product views. 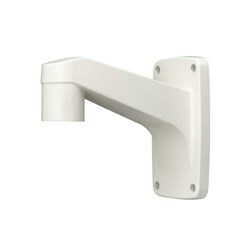 FactoryOutletStore stocks a full line of accessories like Wall Mount Bracket for the Samsung SCP-3120. The Samsung SCP-3120 is sold as a Brand New Unopened Item.